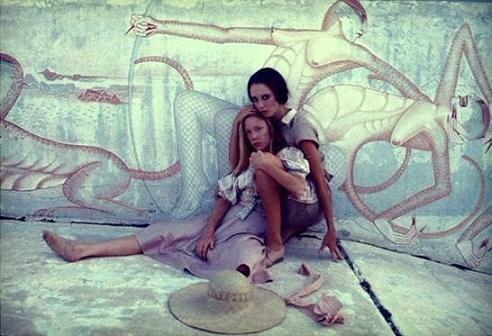 Of the dozen or so films from the remarkable output of Robert Altman in the 1970s, 3 Women is my favourite. It's a beguiling psychodrama about the obsessiveness and possessiveness of the personality of one woman over another in a dreary California town. It’s been said this film was born in a dream Altman had as he was preparing for his wife’s impending delivery of their baby. As such, it’s a rare film from Altman that is completely original and written solely by him. He also gets solo producer credit, thus rendering this film a true auteur effort and as singular a vision as anything in his filmography. Sissy Spacek plays Pinky, a peculiar young girl recently hired by a seniors' home to provide care for elderly patients. Immediately she’s smitten with a self-styled ingenue, Millie Lammoreaux (Duvall), who walks around the facility like she’s the bee’s knees with a cocky self-confidence that covers up some latent social insecurities. When Pinky sees Millie’s advertisement for a roommate, she quickly snaps it up and enters Millie’s life. Most of the picture is played either in the seniors' home or in Millie’s apartment complex, a distinctly Californian motel-style complex filled with vagabonds and various other West Coast swingers. It doesn’t take long for Millie to become agitated by Pinky’s homely habits and social leaching. The relationship weakens to the point where Pinky attempts suicide, which she survives. But this curiously turns her into a new person, as she adopts the personality of Millie and forms a strange symbiotic relationship with a pregnant woman from the complex (Rule). Shelley Duvall is magnificent as a chatterbox whose every line serves to mask an internal fear of some sort. Her performance features delicious dialogue loaded with subtext, which she delivers in an unusual monotone style. I can’t help but think Duvall’s wide-eyed naiveté combined with Altman’s morose languid pacing might have influenced the casting and tone of Stanley Kubrick’s The Shining. Altman is at the top of his game directing his trademark observational camera to look at Millie one way, then in a remarkable shift changing our perspective dramatically. It's a screenplay as deviously crafted as his technical camera work and sound design. The first shift occurs near the midpoint when we see Millie’s bubble of self-confidence destroyed for the first time by her snobby neighbours. The second dramatic shift occurs after Pinky’s recovery, as Altman takes a cue from Henri-Georges Cluziot in Diabolique or Ingmar Bergman in Persona by merging Pinky with Millie in a surreal, dreamlike phasing of reality for both characters. The sanity of both girls comes into question resulting in an intellectually dizzying finale that ultimately ends in a truly beguiling but satisfying question mark in the final frame. Truth be told, I’ve never been a fan of Altman. His deliberate style is spotty for me, working marvellously in The Player, but oddly never landing well for his most revered work, Nashville. Yet here this 'distant' style, including long zooms and slow panning across characters and conversations, creates a palpable tension and gets under your skin like nothing else he's done. Altman masterfully uses counterpoint to amplify this tension. For example, watch how Altman follows Duvall’s incessant chattering while panning away to Spacek ogling her every move and word from afar. Not a word of Duvall’s dialogue matters, narratively speaking, but it’s the silent reaction shot of Spacek that tells us everything we need to know in the scene. At 124 minutes, it’s a long, brooding and tonally ambitious film that's challenging to sit through for those with attention deficits. But the film pays off handsomely in a painful and emotionally intense third act. 3 Women is available on Blu-ray from The Criterion Collection. This is by far my favorite Altman film, possibly because it's not like his other's, which I too find spotty. This one is a masterpiece.